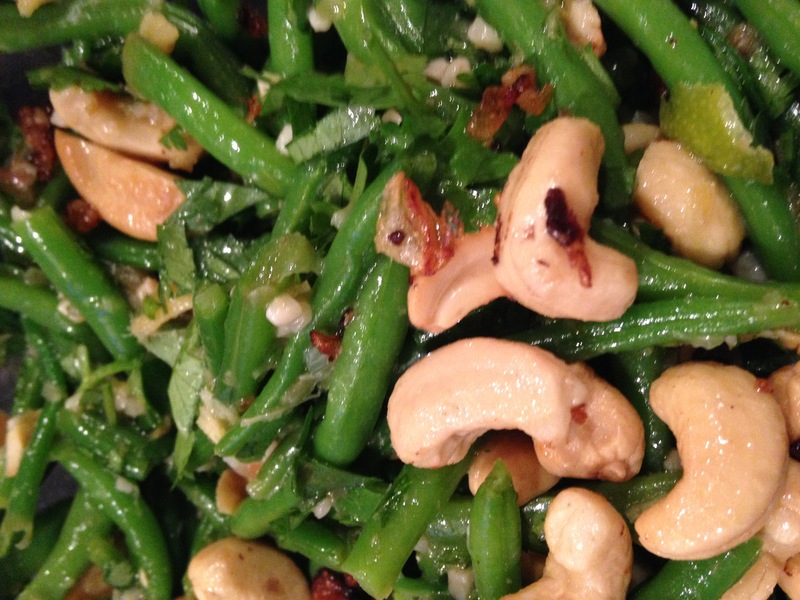 Got together with friends to make a feast recently and found a tasty-sounding Bon Appetit recipe to try — Mixed Beans with Peanuts, Ginger and Lime. Made a couple changes in the recipe because of nuts, lack of beans, and other stuff. 3 kaffir lime leaves, finely chopped — I went to 4 stores, including international markets, and couldn’t get these. The guys at both the Mexican markets and Asian markets laughed at me. I thought that was comical myself that they didn’t carry them. Heat 1 Tbsp. oil in a small skillet over medium and cook shallot, stirring occasionally, until tender, about 3 minutes. 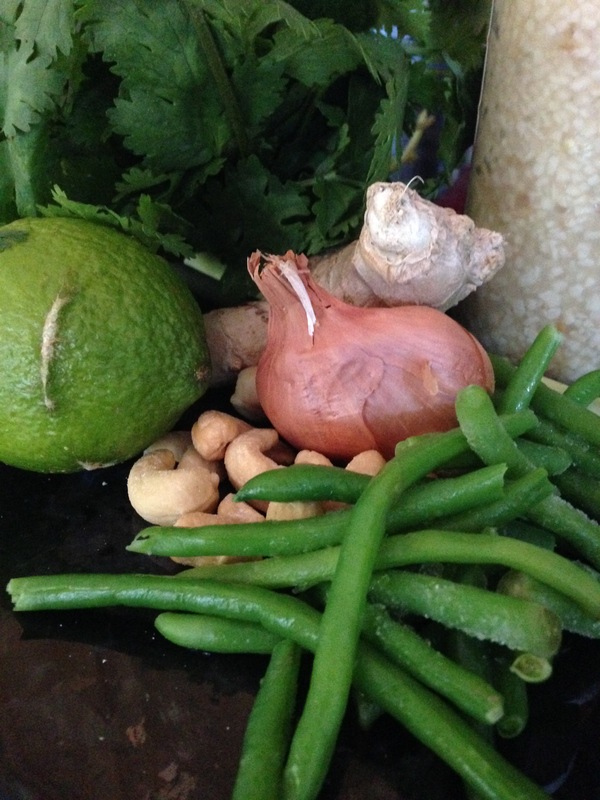 Add ginger, lemongrass, garlic, and coriander and cook, stirring, until very fragrant, about 1 minute. Transfer to a large bowl; season with salt and pepper. Heat 1 Tbsp. oil in same skillet over medium-high. Cook peanuts, tossing often, until golden brown and fragrant, about 2 minutes. Transfer to paper towels; let cool, then coarsely chop. Set aside 1 Tbsp. peanuts for serving. Whisk kaffir lime leaves, lime zest, lime juice, sugar, ½ tsp. salt, and remaining 3 Tbsp. oil into shallot mixture. Add beans, remaining peanuts, and ⅓ cup cilantro and toss to coat; season with salt and pepper. Serve topped with more cilantro and reserved peanuts. It was good, but nothing that exciting. Don’t know if the lime leaves are what would totally bring it in. Glad I made it, would not discount making it again, but not top of my list. This entry was posted in Uncategorized and tagged Asian, beans, bon appetit, cashews, cilantro, ginger, lime, peanuts, vegetarian. Bookmark the permalink.